Let’s be honest here, as a desi audience that’s grown up on Bollywood Masala, we are definitely no strangers to the musical. But in Jagga Jasoos, director Anurag Basu tries to push the envelope by presenting most of the movie in tune and verse, an attempt to bring Broadway to Bollywood, something we probably last saw in Shirish Kunder’s equally befuddling debut effort, Jaan-E-Mann. But with an experienced hand such as Basu at the realm, some stunning cinematography by Ravi Varman, as promised in the promos, a promising soundtrack by Pritam, and an extremely good-looking starcast, does this audacious experiment work? Jagga (Saravajeet Tiwari as the boy, Ranbir Kapoor as the bigger boy) is an orphan with a speech impediment whose life gets a new meaning when he’s adopted by “Tutti Footi” Bagchi (Saswata Chatterjee), an idealistic intellectual until reality in the form of the government comes knocking, for Bagchi happens to be the man who stumbled upon the Purulia Arms Drop. Bagchi drops Jagga off at a boarding school somewhere in the hills and disappears, the only communication between the two in the form of recorded video messages in a video cassette. A few years later, when the tapes stop arriving, Jagga who is now well-regarded as an amateur sleuth, suspects something fishy, and with the help of a bumbling journalist Shruti (Katrina Kaif), who he meets during the course of his sleuthing, sets out to find his foster father. However, what Jagga doesn’t realize is that his journey is fraught with peril, and involves shady intelligence agents, armed rebels and a weapons dealer so careful, even the world’s top intelligence agencies haven’t been able to trace. Can Jagga and Shruti get out of this alive, and will Jagga ever meet his father again? One must hand it to Anurag Basu and Ravi Varman for having the vision and the drive to make Jagga Jasoos, and from the first frame, it’s quite clear that this is an attempt to try a new narrative. Unfortunately though, good intentions do not a good movie make, and Anurag Basu the writer fails Anurag Basu the director. Yes, there are some extremely clever bits, and the first half for the most is a pleasant enough watch without raising the stakes too much, but it all falls apart spectacularly in the second half, and for an audience unused to this format, it is especially painful. Yes, Ravi Varman’s cinematography is stunning, but due to the lack of a cohesive script, the movie comes across as a big budget screensaver. Ranbir Kapoor has always been termed as a star in the making and his performance here will tell you why. He throws himself into the part of Jagga with such gleeful abandon, that for a few moments, you forget that he doesn’t look like a teenager. But his performance is let down by yet another insipid performance from Katrina Kaif, which is a pity, for a more competent leading lady might have made the on-screen proceedings just a bit more palatable. Saswata Chatterjee is brilliant and his sequences with the adorable Saravajeet Tiwari are absolutely heartwarming. Saurabh Shukla is wasted in an inconsequential role, as is Sayani Gupta, and to make things even more infuriating, there’s a cameo in the climax, that seems like a desperate attempt to pull something out of a hat the rabbit already escaped from. 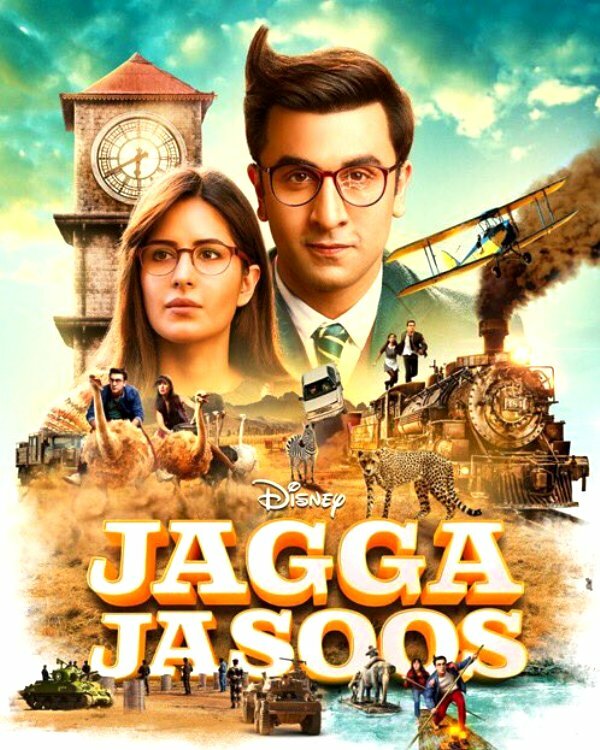 To sum it up then, Jagga Jasoos is a brave attempt at trying a new narrative style in Bollywood and is one of those movies that make a genuine attempt at being a true cinematic experience, but in the face of some insipid writing and an equally ineffectual leading lady, blows up in the face of the audience.